When others are still setting up, you are already turning. Our new three-jaw chucks make that possible. They shine with excellent repeatability, a simple and fast jaw changing system and a large thru hole. At the same time they are as effective, easy to operate and flexible as all the HAINBUCH products. With B-Top turning becomes even more efficient, faster and simpler. A complete set of jaws can be changed in less then a minute. There is no safety risk, because the chuck wrench can only be removed when the wedge bar locks into the gear tooth system of the chuck jaw. 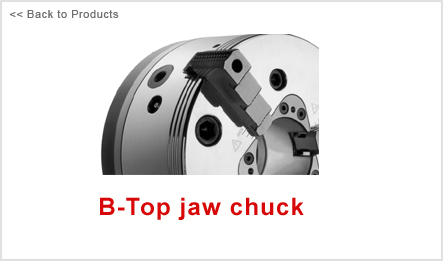 Because of the excellent repeatability of the chuck jaws, re-machining them is not necessary. Would you like to save some money? B-Top runs without a hitch. And it reduces set-up times and costs significantly. .